Text includes a general Catholic martyrology, as well as a separate martyrology following the Franciscan and Poor Clares calendar. 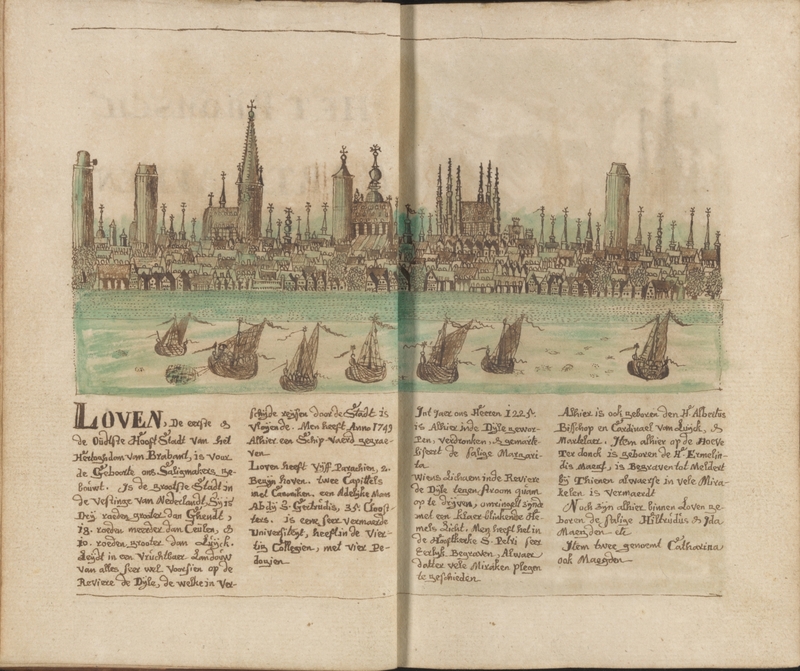 Two colored pen and ink drawings are also included, one of St. Peter's Church in Louvain, and one of Louvain itself with text about the city and its environs. This opening is of the city of Louvain. Too tightly bound to determine collation. Manuscript is bound in leather with gold spine decoration. Written in a small semicursive script in Dutch or German and Latin. pp. iv-v: brown and green pen and ink drawing of Louvain. Manuscript 76, The Obrecht Collection of Gethsemani Abbey, Trappist Kentucky.